Occasionally I get opportunities to write sponsored posts about products or services. When I feel like the product might be something that you readers would enjoy, I pass them along in Saturday posts that I call Sponsored Saturdays. The ultimate goal with these sponsored posts is to introduce new products and be able to do cool giveaways either with the company that is being sponsored or with revenue from the sponsored posts. This sponsorship today is brought to you by Mrs. Cubbison's who we have partnered with for this promotion. You can find their Facebook page with coupons and some fabulous stuffing recipes here. They also have a YouTube channel with tips and tricks here, and if you are a Pinterest addict like me you can follow them on Pinterest here. The food that you couldn't go without? 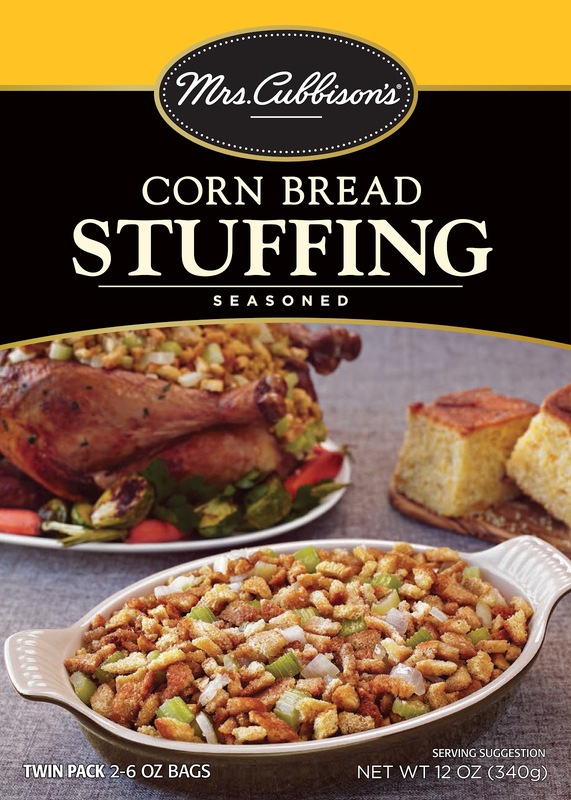 If you said stuffing, you and I are on the same page. You are also in good company. Stuffing is just behind turkey as America's favorite Thanksgiving food. Stuffing recipes are also the most likely Thanksgiving recipes to be passed down between generations. I've lived away from my immediate family for all my adult life so I've gotten to spend Thanksgiving with different extended family and friends. Since stuffing is my favorite part of Thanksgiving, somewhere along the way I learned to make my favorite kind of stuffing to bring to Thanksgiving gatherings. This recipe I'm sharing today is a variation of that recipe. 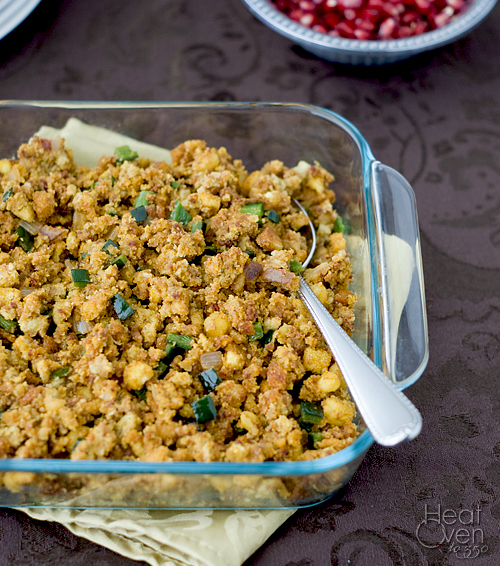 Since we love Mexican and Southwestern food in my family, I gave it a spicy twist using chorizo sausage and chipotle chiles in a cornbread stuffing. I added hominy to increase the corn flavor and poblano peppers because I love how they taste. The finished stuffing is a fun change from the regular celery/onion/sausage stuffings and easy to make because I used a pre-seasoned cornbread stuffing mix for the base. 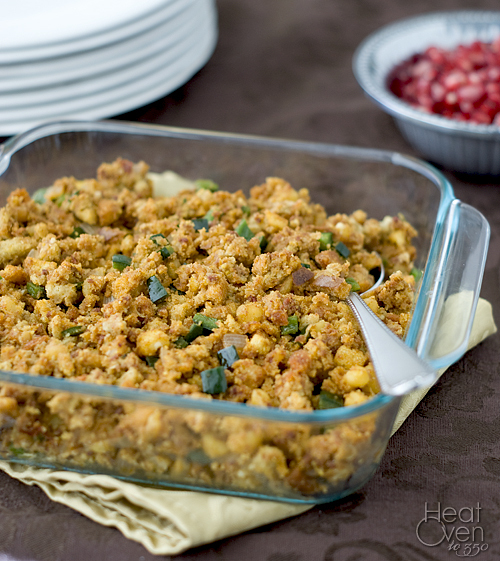 This would be a great stuffing to make if you were looking to mix things up a bit at your Thanksgiving dinner or to have an excuse to make stuffing any other day of the year. Place chorizo in a 12 inch non-stick skillet over medium heat and cook until no longer raw, about 5 minutes; stir in butter, onion, garlic, poblanos and hominy; cook until tender. Place stuffing in a greased 9x13 baking dish, covered, and bake on middle rack for 30 minutes. Remove cover and bake for an additional 10 minutes for a crisper top. Wow does your recipe look yummy. Stuffing is my favorite part of the meal! come and see us this week. We are giving away an awesome $75 swank bag from Pick Your Plum. I agree...stuffing is my favorite part of Thanksgiving too!! I make a Herb Mushroom Leek stuffing I look forward to every year! This look good too!! I always think southwest flavors when it comes to cornbread stuffing!